Maryland Gov. Larry Hogan announced plans Thursday to move forward with the Purple Line -- but that plan will be contingent upon receiving funding from Montgomery and Prince George's counties, he said. The proposed Purple Line will be a 16-mile light rail connecting those two counties. It was previously estimated to cost about $2.45 billion, but Hogan said Thursday the project has been slightly altered to be more cost-efficient. The Purple Line will still have the same alignment and same number of stations, but costs have been reduced by cutting back the length of time between trains, Hogan said. "I wasn't a huge proponent of the Purple Line, but I was never against it," he said. "I just said it was too expensive." He called the Purple Line "a long-term investment" that will be a driver for economic growth, acknowledging that the purple tie he was wearing at Thursday's press conference had been selected purposely. "I wore the purple tie for the Purple Line," he said, to laughter in the room. 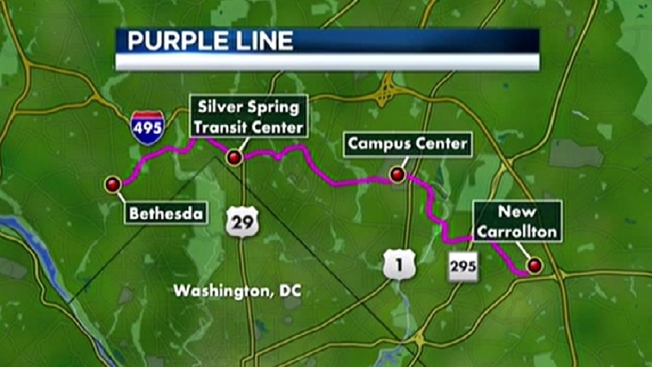 The Purple Line will integrate seamlessly with transit systems already in place, Hogan said. "It will be built in a part of our state that has demonstrated strong support and use of mass transit," Hogan said. The decision to move forward with the Purple Line received praise from the business community, which will likely see increased connectivity and better access to the work force. "Roads in Maryland have been a real problem, the bridges, the tunnels, and so we commend the governor for that big investment," Jim Dinnegar of the Greater Washington Board of Trade said. However, it remains to be seen whether Montgomery and Prince George's counties will contribute the additional funding for the project. Hogan also announced plans Thursday to spend nearly $2 billion on roads, highways and bridges throughout the state. "Maryland's road network has suffered from chronic underfunding," Hogan stated, saying the planned projects will affect the daily lives of state residents. The plan reflects the Republican governor's goal to bring greater focus to roads. Hogan announced that another proposed light rail project, the Red Line in the Baltimore area, will not be constructed "as currently designed." As proposed, the 14.1-mile, east-west light rail would have connected Woodlawn in Baltimore County with downtown Baltimore. The news conference in Annapolis was Hogan's first public appearance since he announced Monday that he has been diagnosed with lymphoma. Hogan appeared in good spirits Thursday. He received results from a bone marrow biopsy this week showing his cancer is stage III, not a more advanced stage IV, he said to widespread applause. "It's much less complicated even though it's pretty far spread," he said. "It makes my chances much, much better. It makes it easier to go after this thing." On Monday, Hogan will check into the University of Maryland Hospital Center in Baltimore to begin four days of intensive chemotherapy.